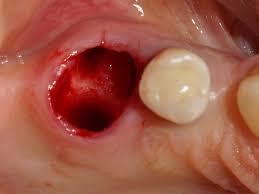 After an extraction, it’s important for a blood clot to form to stop the bleeding and begin the healing process. That’s why your dentist will ask you to bite on a gauze pad for 30 to 45 minutes after an extraction. If bleeding or oozing continues after you remove the gauze pad, place another gauze pad on the area and bite firmly for another 30 minutes. You may have to do this several times.